It's been amazing to watch our little garden grow. 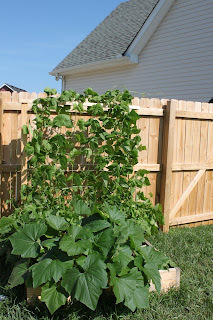 Our pole beans are now toppling over the trellis and the fence and we have green tomatoes galore. You just really need to click back to my post from 5/25 to truly appreciate all the growth that has taken place in such a short time. 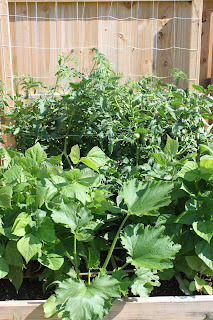 We have solved some of our over crowding problems by putting metal rings around the bush beans to keep them in place and by tying back the tomato plants. Things seem to be going better and look a little less messy as well. 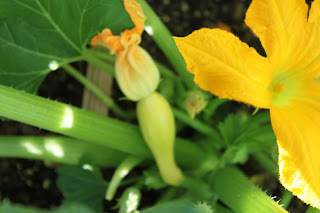 We actually have several squash blossoms blooming and one little squash starting to grown. I can't wait for fresh yellow squash. Yum! We have found a couple of pests. We have identified our eggplant destroyers as flea beetles and have recently purchased some organic spray to help get rid of them called Ecosense. I sprayed it today and will surely update you on it's results. We also encountered some really nasty slugs today and have plans to set out beer traps tomorrow. Our biggest success so far has to be our bush beans. Look how big they have gotten! 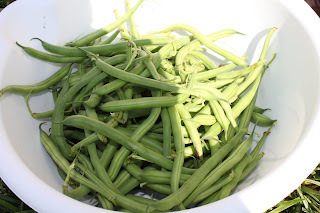 Here are all the beans we harvested today off of our 1st bush bean plant. We actually have 3 more bush bean square sections that are not quite ready just yet because we planted those from seeds. This one had a little start since I bought it in plant form. After we harvested I began to prepare them for freezing. I have read that fresh beans only keep about 3 days in the fridge so I decided to go ahead and freeze them so I had a little more time to do what I want with them. 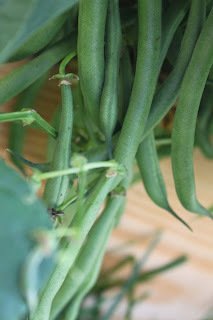 Hint: Be on the look out for bean recipes on What's to Eat? Wednesday in the near future. The first step to the freezing process is to cut off the ends. You can also cut them into thirds if you like, but I decided to leave mine whole since I don't really have a plan on recipes yet. After you do your snipping you rinse them off and drain. 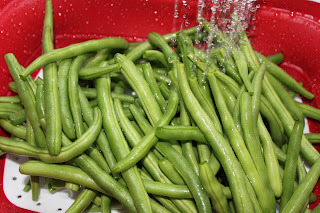 Now bring a large pot of water to boil and drop in about 4-6 cups of beans. Cover with a lid and let boil for 4 minutes. Get a slotted spoon and drop them into an ice bath for about 5 minutes then drain. Finally dry them off a bit and throw them in a freezer bag. I used three 1 quart bags for this particular harvest and filled them up halfway. That way I can just thaw what I need when I need it. Put a date on them and throw them in the freezer. They will stay good up to a year. Yay! Fresh beans for a while! SO cool. I want a green thumb! Wow you have a great garden! Let us know how that spray works, ours has not been "attacked" but I am sure it will happen before summer is over!